The Lord has had me on a journey of sorts for the past year with the number 17. At first I thought it was a personal word for me, but as I pursued it, I felt it was beyond that. Where the process led me, was to insights into Daniel and Ezekiel, with particular reference to what is happening in our nation at this time. The last portion is a declaration over our nation. It began with a dream in 2012 in which I was looking for a phone booth to make a call that cost 17 cents. I was about to take a quarter from my coin purse, but realized I had exactly 17 cents. The dream ended and I woke up with the number 17 very prominent. I was aware it was a prophetic dream, but did not have the interpretation at that time. This year, the number 17 began coming up frequently, and because of the dream, my spirit was quickened to it. The first, in January, was a word on the Elijah List concerning land, but what caught my eye was a graphic of the number 17 that was part of the post. Next, after teaching a prophetic class at my church, I was going through magazine pictures that I use in a prophetic exercise for the students, and the picture on the right fell out of my file. Since there were over 100 pictures in the file, I hadn't remembered this one. 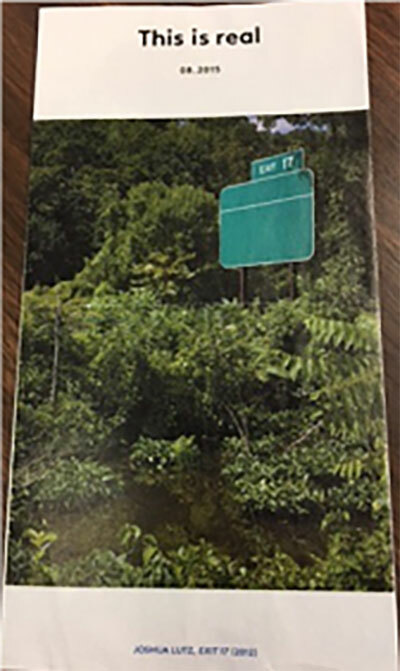 I was struck by the fact that it was a freeway sign, “Exit 17,” but it had no destination and was nowhere near a road. The heading struck me as well: “This is real.” Then just last week, Bill Yount had a post on the Elijah List with a picture of an Exit sign. The word was titled, “Watch for Exit Signs to Light Up in this Season.” Other “17”s came up, throughout the year and I began sensing it was related to 2017. That sent me on a path to pursue the number 17. As I began researching, I found that the number 17 is much more significant in the Bible than I would have thought. It means: Victory, God’s elect, Transition, Promotion. Biblically, 17 is the sum of 2 perfect numbers, 7 and 10 (the others being 3 and 12). One interesting aspect is that the first 17 integers add up to the number 153 (1+2+3+4…..+17=153). This is the number of fish caught in John 21. Much significance to that, but suffice it to say, it deals with the fullness of time and the harvest. There are many references to the number 17 in the Bible, many of which have to do with victory. Here are a few. The Flood began on the 17th day of the 2nd month. The Ark rested on the 17th day of the 7th month. Mount Ararat has an altitude of 17,000 feet. The 17th time Abraham is mentioned is in Gen. 18:18, in connection with the final victory and purpose for his calling. The 17th time Isaac is mentioned is in Gen. 24:63, where his bride is brought to him by Eliezar, whose name means “God helps.” He is a type of the Holy Spirit, the “Helper,” who is sent to seek out a Bride in the earth for Christ. When the Bride of Christ comes to meet Him, it is a time of great victory. Jacob in Egypt lived for 17 years [Gen 47:28]. The Ten Commandments were given in 17 verses of Exodus 20. There were 17 Judges between Joshua and Samuel. Esther is the 17th book of the Bible.."for such a time as this!" The beasts of Daniel:7 have 7 heads, 10 horns. Revelation 13 records the same. The Jewish law counts 17 blessings. The Resurrection occurred on Nisan 17, bringing complete victory over sin and death. It was also the Feast of Firstfruits in the Old Covenant. In Mark’s and Luke’s gospels, the 17th time Jesus is mentioned is when He is victorious over an unclean spirit and leprosy, respectively. John 17 is Jesus' prayer for us. 17 people/nations are named as being present at Pentecost. Rom 8:35-39: Paul asks if 7 things could separate us from the love of Christ. He then tells us 10 things that cannot separate us. Heb 12:18-24 contrasts the Old Covenant and New with 7 statements related to the Old Covenant and 10 to the New. Both passages indicate that the New (10) is superior to the Old (7). James wrote his Epistle 17 years after the Crucifixion and contains material from 17 OT books. A new Museum of the Bible is opening in Washington, DC, in 2017. Cicadas – some species – are in the ground for 17 years when they all emerge at once. In 2017, the states where the emergence will take place are Georgia, North Carolina, and South Carolina. Shakespeare wrote 17 comedies (in the 17th century). There are 17 muscles in the tongue. Two of the most important earthquakes in 1994 and 1995 occurred on January 17: January 17, 1994 in California (Los Angeles), and January 17, 1995 in Japan (Kobe). In both cases, the latitude was 34° (2 x17), and the longitudes were respectively -118° and 135° (- 118 + 135 = 17). Aglow International is celebrating 50 years of ministry in 2017. The Prophecy of Rabbi Judah Ben Samuel – a German mystic and Talmudic scholar, who died in 1217. Prophesied the Ottoman Turks would conquer Jerusalem, rule “eight Jubilee years” (400 yrs). The Turks would be driven out, Jerusalem would be no-man’s land for 1 Jubilee year (50 yrs). The next Jubilee year (10th), Jerusalem would return to the Jews ushering in the Messianic end times. 1517 – The Ottoman Turks conquer the Holy Land, Jerusalem – reign 400 years (8 Jubilees). 1917 – The British, under Gen Edmund Allenby, defeat the Turks and enter Jerusalem. The Balfour Declaration is written and accepted by the Allies. For the next 50 years (1 Jubilee yr) – Jerusalem is under British Mandate for 40 yrs, and Jordanian rule for 10 years… a no-man’s land. 1967 – Six Day War – Jerusalem was taken back, Arab armies were defeated. 10th Jubilee of his prophecy would begin in 1967 and end in 2017. The Jubilee of Jerusalem’s reunification. 2017 is a pivotal year. “Suddenly, they saw the fingers of a human hand writing on the plaster wall of the king’s palace, near the lampstand.” (Dan 5:5). The astrologers, soothsayers, and wise men of Babylon could not read or interpret the handwriting. Daniel turns to confront Belshazzar. “You knew all this, Belshazzar, and still you didn’t humble yourself, but defied the Lord of heaven by bringing these cups here and worshiping gods that ‘neither see, nor hear, nor know anything at all’…"(Dan 5:22-24) . Mene means 'numbered'—God has numbered the days of your reign and has brought it to an end. Tekel means 'weighed'—You have been weighed on the balances and have not measured up. Parsin means 'divided'—Your kingdom has been divided and given to the Medes and Persians. The timing: Belshazzar and his nation were under siege, yet he’s feasting. America is under siege by the radical Islamic agenda. The world is under siege by ISIS, Al Qaeda, and other groups. Yet we are being told that America is doing just fine, we’re already great. We have repeatedly heard about how “good” America is. Belshazzar had defiled, or made common, the “holy vessels” from the Temple. Right to bear arms, to name a few. All the while worshipping the “god” of political correctness. God has numbered the days of your reign – the liberal agenda - and brought it to an end – this November?? May it be! It will take divine intervention from the One who "appoints anyone he desires to rule over them." You have been weighed in the balance and have not measured up. Just as Nebuchadnezzar abused the power God had given him, so have our leaders, President Obama, Hillary Clinton, and others, abused the power they have. They have not measured up. The meaning here is not that the kingdom was to be divided into two equal parts, one part given to the Medes and the other to the Persians. The Hebrew word means to divide into pieces, to destroy, to dissolve the kingdom. The Medes and Persians, Cyrus in alliance with Darius, destroyed Babylon, and put an end to the Chaldean kingdom. The kingdom was given first to Darius the Mede (Dan 6:15:31), and after him, to Cyrus the Persian. Lord, may we declare that the liberal “kingdom” will be destroyed or dissolved in this election. Back to the number 17. On September 17, I was reading in Ezekiel about the glory of the Lord returning to the Temple. That sent me on a “glory” path through Ezekiel to find all the passages where he saw the glory of the Lord. There are several very meaningful passages, but when I got to Ezek 8:1, my spirit leapt. I read (NLT): Ezekiel had another vision of the glory of the Lord….On the 17th of September (592 BC). I happened to be reading that very passage on September 17, 2016! He had my attention once again. September 17th also happens to be Constitution Day. On September 17, 1787, the Founding Fathers gathered to sign the document they had created...our Constitution. Ezekiel 10 details the glory of the Lord leaving the Temple in stages. I thought of how the glory of America has been leaving, or declining, in stages – with each succeeding decade. But as I pondered the glory of the Lord returning to the Temple, I allowed my mind to wonder what it might be like to see the glory of the Lord return to America. To have a president that consulted the Daniels, and Josephs, and Deborahs of our day for wisdom and insight and understanding for decisions. Bring back the glory to America that she had in the beginning…and bring it from the EAST! Washington, DC. I had not been thinking about candidates or the election or anything political at the time. My spirit was deeply stirred because I sensed the implication of what I was hearing. All of my research about the number 17, Daniel and Ezekiel, has led me to the conclusion that 2017 will be not only a very significant and pivotal year, but one of amazing victories and major shift in both the natural and spiritual realms. It will not be just another year with business as usual. I believe we will see the glory of the Lord, but it may not come in the way we expect. God revealed one aspect of His glory to Ezekiel, and I sense that as we are watchful, prayerful, and expectant, He will reveal His glory in and through people, circumstances, and events. There is a remnant in our nation that is rising up to stand in the gap, make prophetic declaration, and believe God for a “dissolving of the kingdom” that seeks to destroy our foundations. Lord, bring Your glory back to the United States…to the glory You gave her when she was birthed! Father, You speak over and over in Your word about the remnant. You said You wouldn’t destroy Sodom and Gomorrah if there were but 10 righteous. You told Ezekiel to set aside a few strands of his hair to represent the remnant. You have told us when You look at a nation, it is the believers in the nation that carry the destiny of the nation. Father, awaken Your remnant in THIS nation! Awaken us to the pivotal hour in which we are living and the power You have given us to shift the nation. Strip away the deception that would cause people to be either apathetic about this election, or to stay away because of the choice of candidates. Father put a fire in the hearts of Your people for this nation once again! The fate and the destiny of the United States hangs in the balance. In this season of Yom Kippur, we repent for the sins of our nation, and they are many, and ask that you would show mercy, which triumphs over judgment. We humble ourselves before you and ask forgiveness for having turned completely away from You and Your truth. Father, we call for a divine intervention in our nation at this time. We stand against the forces that would defile the “sacred vessels” of our nation – the Constitution, the Bill of Rights, religious liberty, the right to bear arms - while worshipping the god of political correctness. We say ‘No’ to the spiritual wickedness in high places and stand against the spirit of lawlessness that would attempt to tear down this nation which You raised up to be a light among the nations. Father, we declare that just as You brought Your glory back into the Temple from the east, so You will do once again for our nation…bring the glory back to America that she had in the beginning…and bring it from the East – Washington DC. Just as the decree of Haman against the Jews was overturned, Father, we ask that in this election, “the opposite will occur” (Esther 9:1) and You would bring an end to the kingdom of darkness that seeks to destroy this nation. We decree a season shift in the nation, over the land, over the people. We declare that we will not look to the natural, but will look to you, Jesus, the Author and Finisher of our faith. Make America great again…not by might, not by power, BUT BY YOUR SPIRIT!